Wayne Rooney: England's greatest ever striker? 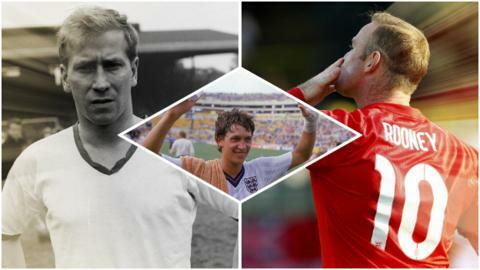 England captain Wayne Rooney secured his place in history when he elevated himself above World Cup-winning legend Sir Bobby Charlton as his country's highest goalscorer - but is he the greatest? He now stands ahead of the 77-year-old Manchester United great, who scored his 49 goals in 106 appearance and ex-Tottenham Hotspur forward Gary Lineker, who scored 48 goals in 80 games for England. Listen to Wayne Rooney on BBC Radio 5 live. Is Rooney greater than Charlton? This argument will always be framed by one significant factor. Charlton is one of only 11 England players to win a World Cup - and was pivotal in that triumph. Charlton illuminated England's summer of '66, scoring the famous thunderbolt against Mexico in the group games then twice in the semi-final against Portugal at Wembley before final victory against West Germany. He retained his importance in Mexico four years later when manager Sir Alf Ramsey's decided to withdraw him to preserve energy for the semi-final. This is regarded as the defining moment when what seemed certain victory from two goals up was transformed into 3-2 defeat against West Germany in the quarter-final in Leon. Rooney's three World Cups in 2006, 2010 and 2014 have all been disappointments - but are there mitigating circumstances that can be used in his defence? Charlton was surrounded by a genuine world-class "Golden Generation" of England players such as goalkeeper Gordon Banks, the late Bobby Moore and Alan Ball as well as World Cup final hat-trick hero Sir Geoff Hurst. The status of World Cup winners gave that England side an aura that Rooney has never enjoyed, perhaps increasing the personal pressure that brought 11 yellow cards and two reds compared to Charlton's clean record. Charlton also had the consistency of selection so dear to Ramsey, with effectively only five real changes to the first-choice England line-up between 1966 and 1970. Only Keith Newton, Terry Cooper, Brian Labone, Alan Mullery and Francis Lee replaced George Cohen, Jack Charlton, Nobby Stiles and Roger Hunt and no thought of the experimentation seen today. He figured in an era of either no or limited substitutions whereas later years have brought about the games of wholesale changes. Rooney has been substituted 55 times while Charlton was only taken off on five occasions. Rooney has figured alongside 100 different England players since making his debut as a 17-year-old against Australia at Upton Park on 13 February 2003. He has had 23 of what could be reasonably termed as strike partners, from former Arsenal and Everton player Francis Jeffers in his first game, to Leicester City's Jamie Vardy in San Marino on Saturday. None of England's team or substitutes from his debut play in the Premier League today, apart from Rooney himself, who will be 30 in October. The generation around Rooney, such as David Beckham, Frank Lampard and Steven Gerrard, also failed to deliver on the biggest international stage - and how significant was Paul Scholes' decision to retire from England duty after Euro 2004? Rooney and Scholes were a natural fit at club level. How much more could Rooney have achieved for England with the assistance and partnership of that world-class figure? History, however, will surely suggest Charlton remains a more significant and influential figure than Rooney. The World Cup medal seals that argument. Charlton, in addition, was not a striker, scoring goals initially from a wide position then as a deeper-lying playmaker, which makes his 49 goals arguably even more creditable. What about compared to Gary Lineker? Rooney edged ahead of Gary Lineker's 48 goals to close in on Charlton but, despite his wonderful achievement, the latter must still hold sway in terms of England greatness. Lineker was a Golden Boot winner with six goals at the 1986 World Cup in Mexico, adding four goals at Italia 90, including the equaliser in the semi-final that England eventually lost on penalties to West Germany. Rooney has scored only one goal in 11 appearances in the World Cup finals, against Uruguay in Brazil. Lineker's England goals came at a rate of one every 136 minutes compared to 162.5 minutes for the Manchester United forward. Charlton scored his at one every 193 minutes. He also has only one assist, although he has created 18 chances in those three World Cups, whereas Lineker made an indelible mark in 1986. Ten goals in 12 games at a finals is an outstanding record. Rooney deserves huge respect and admiration for his feats and, while this is not a criticism, he still comes in behind Charlton and Lineker. If Rooney's England career will be defined by anything other than his goal record, it will be his mystifying failure to transform his brilliant natural talent to a major tournament with England, after "Roo-mania", as a 17-year-old at Euro 2004. Rooney has suffered a mixture of circumstances from pre-tournament injuries, suspension and subsequent red cards - but nothing can disguise that he has not delivered his full potential after that glorious Portuguese summer. In Germany in 2006, he arrived at England's Baden Baden HQ, declared fit after a broken foot, with the words: "The Big Man is back in town". But he never looked in shape, missing the first game against Paraguay before coming on as a second-half substitute in the second game against Trinidad and Tobago. He was then isolated in a lone striking role after Michael Owen suffered a serious knee injury against Sweden and perhaps a combination of all these frustrations led to his red card for stamping on Ricardo Carvalho in the quarter-final loss to Portugal. In the 2006 World Cup quarter-final, Ronaldo encouraged the referee to send Rooney off, but Rooney said "I bear no ill feeling to Cristiano but am disappointed he chose to get involved"
The campaign in South Africa four years later was a miserable, joyless affair locked away in the infamous "Camp Capello" at the Royal Bafokeng Sports Campus in Rustenburg. Rooney, along with John Terry, almost became a symbol for Fabio Capello's austere regime as he described his typical day as "breakfast, training, lunch, bed, dinner, bed." Adding for good measure "there are only so many games of darts and snooker you can play". It led to a series of wretched personal performances and a World Cup best remembered for his ill-advised criticism of England's fans into a television camera after a horror show against Algeria in Cape Town. In the 2012 Euros in Poland and Ukraine he missed England's group games against France and Sweden while serving a ban after picking up a red card for kicking Montenegro defender Miodrag Dzudovic in a stormy qualifier in Podgorica. He scored the winner against co-hosts Ukraine in Donetsk but once again looked out of condition, not helped by inactivity and an unwise decision to take pre-tournament holiday in Las Vegas - a decision he now accepts was a mistake. Rooney's 2014 World Cup campaign in Brazil saw him as one of the few players not to seriously damage his reputation as England crashed out at the group stage after losses to Italy and Uruguay. It was also not Rooney's fault that long-time allies such as Gerrard and Lampard found Brazil 2014 a World Cup too far. Rooney was one of England's better players and his willingness to play a left-flank role to accommodate Raheem Sterling against Italy was testimony to his team ethic. Striking at the heart of soft opponents is another charge levelled at Rooney - harsh and one he does not deserve. Rooney has scored five goals against San Marino and three against Kazakhstan but he can hardly be blamed for the opposition presented to him. Twenty eight of his goals have come against countries that did not actually exist when Charlton played, such as those coming out of the break-up of the old Soviet Union and Yugoslavia or those such as San Marino, who were not an international team then. Charlton played more friendlies than Rooney - 49 as opposed to 41 - and also had his share of what could be called "soft-touch" goals such as a hat-trick against the USA in May 1959 and five in two World Cup qualifiers against Luxembourg in October 1960 and September 1961. He also scored hat-tricks in an 8-0 friendly rout of Mexico at Wembley in May 1961 and the 8-1 win in Switzerland in June 1963. Rooney, who only scored 14 goals in friendlies compared to Charlton's 22, has a record that is testimony to his endurance and importance. It should not been downplayed by accusations about the level of opposition. So is Wayne Rooney an England great? Rooney's achievements must not be downplayed and he fully deserves a place in history. The goals are in the record books. The Rooney story is the narrative of England's last decade. He has been present in dark times as well as light, the consummate competitor, dressing room inspiration, team man and the England player opponents feared most. From Sven-Goran Eriksson through to Steve McClaren, Fabio Capello and Roy Hodgson, every England manager has wanted Rooney in his team - which speaks eloquently for his importance. And Rooney has eclipsed a record that outstanding England strikers such as Lineker, Alan Shearer and Michael Owen found beyond them. Feb 2003: Became the youngest player to play for England when he appeared in a friendly against Australia. He was 17 years and 111 days old, a record which Theo Walcott has since lowered by 36 days. Apr 2006: Fractures a metatarsal bone in his right foot six weeks before opening fixture of the World Cup. Manages to play in tournament but was far from peak fitness. Sep 2003: Became England's youngest goalscorer when he netted in a 2-1 European Championship qualification win over Macedonia. June 2006: Sent off for "stamping" on Portugal's Ricardo Carvalho in the World Cup quarter-final in Germany. England lose match on penalties. Oct 2013: Became England's highest scorer in competitive games, breaking Michael Owen's record of 26 goals when he opened the scoring in a 4-1 World Cup qualification win over Montenegro. Oct 2011: Sent off during a Euro 2012 qualifier against Montenegro for kicking out at Miodrag Dzudovic, leading Rooney to miss the first two games of the tournament. Rooney's place has occasionally been questioned but has there ever been a serious and credible argument to suggest England would have even been better off without him? Before his record-equalling game in San Marino, England had played 105 games with Rooney and 41 without him. The win percentage without him (65.9%) may be greater than that with him (59.4%) but his record on the pitch reflects his importance. The lack of impact at major tournaments, unlike Charlton and Lineker, may leave him just short of the coveted status of a true England great, and in a worldwide context short of Barcelona's Lionel Messi and Real Madrid's Cristiano Ronaldo. Rooney is, though, the finest England player of his generation, an attacker who excelled at this elite level. He has a place in history that is well deserved and a landmark that serves as a proud monument to his international career.